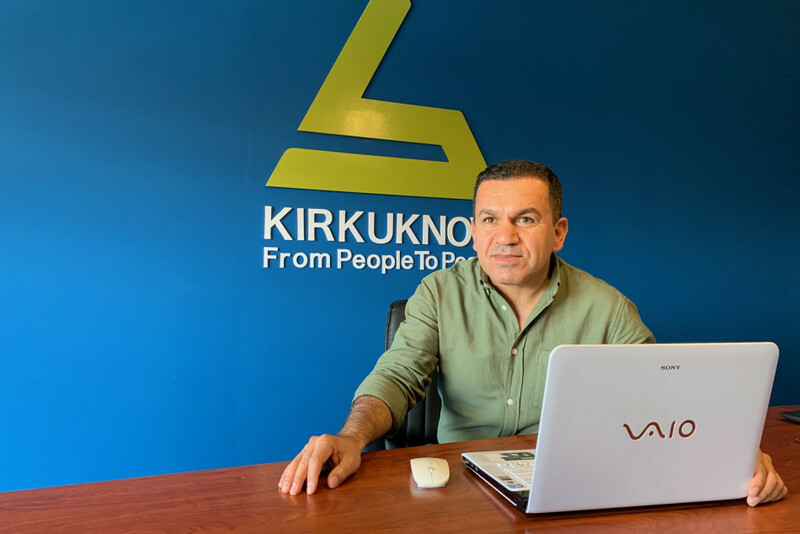 Salam Omer, Editor-In-Chief at KirkukNow, a website that covers the region known as the disputed territories in Iraq in an interview expressed his views in regard to the work of the media in these territories, citing KirkukNow as an example of professionalism in its coverage of the events taking place there. The media outlet covers developments in the region encompasses Mosul in northern Iraq to oil-rich city of Kirkuk further to the Iranian border of Iraq. This is the region the so-called Islamic State ISIS was most active, many ethnic and religious components live here and have various political loyalty and belong to different groups of people. Salam says that this region was formerly controlled by Kurdish forces until October 2017. However, this region was never formally belonged to the Kurdistan Regional Government. After Kurdish bid for independence and their ill-fated referendum, Iraqi federal government re-controlled all these regions. This region is unstable from the security point of view. Its people are locally divided and various militias exist which are unfamiliar with the region. They all have an impact and influence the dynamics of the region. Von Oliver M. Piecha : What does Kirkuk Now cover? Salam Omer: We want to pilot a project, and we believe that it is possible for a serious and unbiased media to be able to operate in a conflict-ridden region like the disputed areas. The people of this region have different ethnic backgrounds, also they have different religious and cultural affinities. We also want to prove that media can become a tool for mutual understanding and dialogue. In Iraq, media channels are not independent and they work to foster political and religious agenda of certain groups. Media represents the interest and wishes of only certain people. That's why you cannot find professional media and they all publish fake news. We own a channel that is reliable and express truth in the languages of the people of this region ( Arabs, Turkmen, Kurds and some part of our news are published in English language). We publish the same news in various different languages spoken in the region and the people of this region have diverse beliefs and attitudes. Von Oliver M. Piecha: How is this media received in a region which only knows print media? Salam Omer: Journalists and media are part of the problems in Iraq. They cannot implement their roles completely. We want to be different and act differently. The politicians also understand and acknowledge this. We are not a huge media corporation but we have huge expertise and knowledge. This is evident during critical times and crisis and people know that honest news help them. For instance, during critical times and when negotiations are underway, such as clashes and political deadlocks like those of the Kurdish referendum for independence, you do not find another media working like us in the region as we do not take sides. Unlike other media which are supported by political parties and personalities we are independent. From this perspective we can argue yes we have achieved our goals and people know and trust us. We speak will all the stakeholders in the same day and our task is to give equal chance and space to talk, whether Arabs, Turkmen or Kurds; we want to become a platform for everyone regardless of ethnicity and or religions. For example when we talk about the vacancy of Kirkuk Governor and or Nineveh Governor, it is vital that our agency does not only cover one side of the argument but rather show the bigger picture. I feel that people do understand the significance of this work and it is possible for our project to be an alternative and appropriate source of media. Von Oliver M. Piecha: To what extent the disputed area represent the roots cause of all the issues of Iraq? Salam Omer: What is going on in Iraq? At the heart of this issue is the question of identity, whether we are Kurds and or Arabs, Shiites and or Sunnis, Islam and or a mixture of other beliefs? Whenever a group of people become dominant other groups fear their own identity, this is true for what happened in Baghdad and what is going on right now. The same is true for the disputed areas. This all depends on who rules in Baghdad, are they marginalizes each other in Iraqi central government and or are they cooperating and working together? Whenever there are issues in Baghdad they use the disputed areas as a weapon against each other. They show off their power in the disputed areas, in order to make problems, if you understand the issues of Baghdad then you do understand the disputed areas. This will consequently impact all over Iraq. Von Oliver M. Piecha: Is Iraq a backward country? Does Iraq has any future? Salam Omer: Many Arabs in Iraq positively think about this issue. Iraq has always existed. Always a powerful country- for the Kurds this is a different issue. Since Iraq become a sovereign country it lacked mutual understanding and coexistence among its diverse communities. There were no understanding what it means to live under the flag of Iraq. What does it mean to be an Iraqi. Despite this, there are many people who identify themselves as Iraqis, I am a pragmatist, if Iraq disintegrates then we all become weaker. It is not helping and pleasant to be weak in an unstable region like this. I think confederalism is a good idea. A confederal Iraq is far much better than three smaller and weaker states of Kurds, Sunnis and Shiites. The problem is not the devastated houses alone, the problem is people's lack of understanding what ISIS has destroyed regarding social cohesion. Von Oliver M. Piecha: Is it a possible idea to be implemented or is everything now pessimistic? Salam Omer: ISIS destroyed many, doubting each other has ramifications, it is not only the Kurds but Sunnis also feel they are marginalized. This is a good opportunity for political extremism. ISIS benefited from the much divided and fragmented Iraqi society. I believe if political power is shared with Sunnis many of the current issues affecting Iraq will be resolved. But those who are powerful in Baghdad do not understand this, it is their way of thinking, they do not sympathize with the Sunnis, In the old days the Sunnies were dominant and powerful in Iraq, now they feel they are silenced and are powerless. Their areas are also destroyed. They feel they are defeated and they are victims. This is indeed problematic, that is why we have to deal with it and sort it out. Von Oliver M. Piecha: What are the vital characters which determine the future of the disputed areas? Salam Omer: On the one hand it is the Federal Iraqi government with all its factions including the security forces, Shiite militias, different ministries and Kurdistan Regional Government with all its local divisions. The security apparatus and oil economy also play an important role. The Turkmen in their own residence surrounding Kirkuk and Talafar have their own understanding as well. They seek Kirkuk to be an independent governorate with a strong tie to Baghdad. The Turkmen do not want to belong to the Kurdistan region. This is the sensitive issue. As usual, regarding oil and the city of Kirkuk and as we know now all the disputed areas are rich and wealthy with oil resources. Externally, Turkey supports the Turkmen, Qatar and Saudi Arabia support the Sunnis, the Iranians are seeking their own interests, the United Nations plays a weak role but they always have a presence in the region. America also palys an important role. ISIS is always an active character in this region and they can and have the wherewithal to destabilize the region, they have areas to evacuate and from there they can resume their moves and activities. Von Oliver M. Piecha: What are the interests of America, Iran and Turkey in the disputed areas? Salam Omer: You know what, in his visit for Kirkuk, the Turkish Ambassador has reportedly told the Turkmen in one of the mosques that "This is the land of our ancestors". KirkukNow was unable to verify this speech, however, this reflects the stance of Turkey that the entire region one day belonged to the former Ottoman Empire. The Mosul Villayat comprised the city of Kirkuk and Sulaimani. Turkey supports the demands of the Turkmen in Kirkuk and Kirkuk is a red line for the Turkish government. Iran is a totally different issue. Iran dreams to enter Syria via the disputed areas. They are closer than ever for fulfilling this dream. Historically these are the regions where the Sunni people are residing. However, in the past decade Iran has used its influence and hegemony on the Shiite Iraqi government in Baghdad to increase its expansionism and change the demography of these areas through the Shiite militias which are closer allies to Iran. Also after the Kurdish held referendum for Indepence Iran has directly and indirectly interfered in these regions. Iran is now active in the disputed areas. The demographic relations among the Sunnis and Shiites in the strategically important areas of northern Iraq have also changed. The Iranians were successful in dividing and controlling the Sunni community areas. They have supported the Shiite Turkmen. This is the well-known classical strategy of divide and control. The Americans under Trump rule do not have a clear strategy, on one hand they need the support of the so-called secular Kurds to balance the Shiite and Sunni conflict, on the other hand they do not want the Kurds and KRG to control Kirkuk and the disputed areas because KRG is a close alley to Turkey. America's stance supports the Iraqi constitution to be the only mechanism to resolve rivalry and animosity among the diverse communities of Iraq. Von Oliver M. Piecha : How can the disputed areas' issues be resolved? Salam Omer: Each of the Kurds, Arabs and Turkmen have their own perspectives regarding the issues and they do not listen for each other. First of all, they need to start a dialogue among themselves, then they should resort to the constitution, in it there is a legal procedure fixed to resolve any conflict. The kind of argument that says Kirkuk has always been an Iraqi and belongs to the Iraqis do not mean anything for the common people. What does this mean? For the people providing basic services are more important than anything, security matters for them, people suffer different kinds of needs and problems and they are tired of and not interested in any ideological rivalry and conflict. Since ISIS onslaught in 2014, the disputed areas were under the Kurdistan region, only to prove the point that Kurdish parties do not have a strategy for these areas. The Kurds did not develop a comprehensive plan to deal with the multiethnic and religious communities of these areas. Now with the Iraqi government retaking control of these areas the region faces the same lack of plan and strategy. The Iraqi government similarly did not have a specific view for this region and they do not know how to govern these unstable areas. The only thing they keep repeating over and over is that the disputed areas are part of and belong to Iraq. But what does this mean? Previously the Kurds claimed these areas belong to Kurdistan, one must ask what will happen next? I believe that Article 140 of the Iraqi constitution provides a good solution. The constitution has specified three phases, first, there is a need for de-escalation, then compensation and the registering of the population, then to be followed by a referendum to determine the fate of the disputed areas, whether they want to belong to the Kurdistan region and or the Baghdad-held government or find another viable solution. De-escalation or normalization of the the situation as it has been mentioned in the constitution means that all the people who were brought to live in Kirkuk during the reign of the Baa'th Regime must return and leave Kirkuk and its surrounding districts. Meanwhile the displaced Kurds and Turkmen return to their places and many people have so far returned to their homes. This is also a very difficult choice because you cannot uproot someone who has probably lived in Kirkuk for 40 years. One cannot go back to Kirkuk of the 1970s and maintain its previous social components. The same is true for Nineveh governorate after overcoming the war against ISIS and striving to maintain the same social fabric that held Nineveh community together before ISIS onslaught. Von Oliver M. Piecha : How is the security condition of the disputed areas? Whereas we often hear that the war against ISIS is over and that internally displaced people can return to their homes. Salam Omer: When you look at Iraq from an external point of view, for example from a European perspective, you see Iraq as a single component, the same as Germany or France. Iraq looks like a sovereign country; however, looking at Iraq from an external perspective, Iraq is a completely different country. For example, we are now sitting in Sulaimani in Iraq; however, there are places just two-hour drive far from here we cannot sit together like this. That is why we need to know which part of Iraq we are talking about. When we say that Iraq is a secure country this proves otherwise, this means to claim that Iraq is an unstable country. That kind of generalization does not work and or apply to the reality of this country. We need to scrutinize carefully, what problem are we highlighting, what region and or part of Iraq are we talking about? Maybe I can move freely in Baghdad, or I can go to Basra, however, Anbar governorate is completely different. These kinds of differences do exist in many countries, generally people in Europe do not understand this. Von Oliver M. Piecha : Is there any future for minorities? Salam Omer: I believe that across the globe and many politicians and academics do not understand or grasp the reality how successful ISIS was in destroying the social fabric of Iraqi community. People see the military taking over ISIS as a kind of victory. They think they can build something after. However, it is not that easy. The problem is not the destroyed houses, the problem is that people do not understand the destruction and devastation wreaked by ISIS and how they destroyed the social fabric that once held the Iraqi society together. Von Oliver M. Piecha : What should be done? Salam Omer: The issue is social peace, and this is a huge task of all mankind since the WWII. This will determine the entire future of the Middle East. This is the subject. People should set aside the differences and the inequalities. The government in Iraq just simply wants the IDPs to return to their homes. However, we are facing a mountain of challenges. Just an example, think about the young Ezidi girls and women kidnapped by ISIS, maybe they were impregnated by ISIS members and have delivered their babies. How can we determine the legal status of these ISIS born children? Are they Ezidi children or Muslims? This is a central jurisprudential issue and challenge for the Iraqi government. There are many complicated issues and consequences that all of a sudden play an important role, What about all those orphans? According to Iraqi laws they are automatically considered Muslims. This is against the will of the minorities. All these relevant issues have implications for the future and become part of the question whether people want to stay here or is it better to leave this country for good? People has to understand what havoc was wreaked by ISIS and its implications. It is so easy claiming that ISIS no longer exists and we will continue. However, the question is how do we look forward, for me this is very important. Von Oliver M. Piecha : Sometimes the Iraqis say " We wish Saddam has stayed and ruled us, because democracy does not work here". They justify what the dictator did in the past. Salam Omer: One can never compare the New Iraq with the dictatorship of Saddam. Despite all the issues we are suffering from, this is an illogical comparison. However, it is true that even the Kurds do say things like that, even though they are themselves victims of the dictatorship of Saddam Hussein. The old days, things were far much better than now, that is why we hear stuff like this. I feel this is an expression of deep hopelessness, an opportunity to express people's anger and hopelessness. I do not stigmatize any Iraqi for saying so, however, this is not true. Despite all the challenges, now there are plenty of doors and opportunities for change. Just recently a young citizen of Anbar region was elected speaker of the Iraqi parliament. I know there are alot of things taking place behind the closed doors, external forces, Iran, America, but people do talk and have dialogue together, they fight and debate together, they are Iraqis but with different opinions. At least there is dialogue going on now and this is how democracy works. These things did not exist during the time of Saddam, we are no longer living under dictatorship. Von Oliver M. Piecha : Are you optimist? Salam Omer: To the extent that we do not resort for violence I am optimist. Everything is liable for dialogue. The most important thing is that the parties talk together. People can have different opinions, they may held extreme ideas but for me it is important that everyone, every component in Iraq have their representatives in Parliament and engage in heated dialogue and debate, this is better than boycotting and civil war.